In my mind I have a list of most over looked, underrated ultra runners. I dunno’ — maybe you have one in your head too — I considered myself one of the most overrated under trained ultrarunners — though I am actually going to race next weekend in Kentucky. 1. The Olsen Twins (Neil and Jon, no they are not twins) – They are both winners, not flashy, yet you never hear much about about them. They can run with anyone and beat ’em too — don’t need to stinkin’ blog to get ‘er done either. 2. Rod Bien – Kinda always overlooked, yet, has won some low key races as well as been right there for some big ones. Also, Rod doesn’t put in big miles, if he did??? Who knows. 3. Joe Grant – Never “heeeerd” of ’em??? You will, he’s 25 and fast. 4. Hal Koerner – Come on, he smoked everyone in 2007 at WS yet nobody picks ’em in the big show in 2009? 6. Max King – I once watched him run multiple 400 repeats in 60 flat in Bend, then polish off the dust with some 200’s in 27’s. Once he gives up his national caliber track nonsense and focus more on ultra’s, the CB rule for your 5K PR is equal to your 100 mile PR will come true. I think Max can run about a 13:30 5K by the way…. 7. Kami Semick – She’s always in the hunt for being the winner, OVERALL, however, Kami draws so little attention to herself and is darn near the most humble person I’ve ever met, I don’t think she gets enough press outside the Bend area. 8. Fatboy – Eugene Trahern, if you only knew how little he trains, I’ve seen Gene run 100’s off of 35 miles per….per month!!. If he trained like a lot runners his age do, Gene would smoke most masters runners out there, Gene has more talent than he lets on. 9. Eric Grossman – He’s not from the West so his talents don’t shine in the Western ultras, however, if he lived out West his performances would be much, much better. 10. a tie Scott Jurek & Dave Mackey – Scott, because too many people always bet against him, he’s my pick for WS this year. Mackey, because if he ever focused exclusively on ultrarunning, he’d likely run under 7:30 at Miwok. Mackey is probably the best all around stud out there, he belongs in the Special Forces with David Goggins. So who is is your pick for the most underrated? Dang it, even AJW has won so many times in the last year that he can’t be considered to be underrated anymore? What about Jeff Riley? Pretty underrated…. I’ll be dominating the mid-pack in Kentucky running the 60K while the Who’s Who of ultrarunning lights it up in Cool. 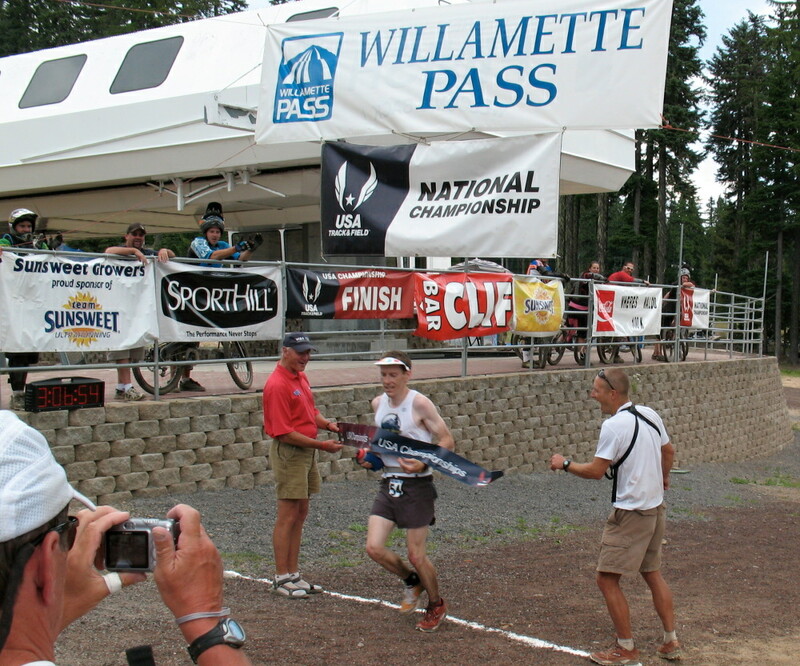 Bradley Mongold – Came out of nowhere to place second (3:43) at WTC in 2007. Ok, so he didn’t come out of nowhere… he came out of the woods where he bow hunts for grizzlies when he’s not setting records on gnarly 200+ mile trails. Looking forward to seeing him hunt Meltzer at MMT this year. @Bryon Powell – Great story about that 2007 WTC. It’s not firsthand since I was about 1/2 hour behind but maybe the two parties will chime in and correct me if I get any details wrong. lowercase was running back of the leaders all day. I think he was in 7th at ALT 2 and just kept picking guys off the whole way to the finish. He passes Bradley, who was in the lead, on the climb just past 49. Having not seen lc all day, he asks, “Are you in the race?” lc, being new to racing but showing great natural instincts, waits until he is 10 yards past Bradley to tell him that he is. A couple of relatively unknown ultrarunners dueling it for the win at WTC. Good stuff. I see Todd Braje winning often but not too much media about him. Also Jasper Haleakas seems to always do well when he comes out to race. He seems like a Mackey, doesn’t race much but when he shows up he does well. Otherwise I think you hit it on the head with this list. I think the fact that you can make a list like this speaks volumes for how deep the sport is. Didn’t Todd Braje just complete a 5:30 50 mile race? Even the people everybody does know (like Carpenter, Krupicka, Meltzer) are approachable, humble, etc., despite their fierce competitiveness. @All – Perfect choices, never heard of Bradley Mongold, which just makes him that much more deserving to be on the list. Braje, fast for sure, solid up to 50, one of these days he’s gonna put it all together up to a 100 miles, maybe at the World’s 100K. Jasper Haleakas, fast and smart too, isn’t like a physics dude at Berkley? I agree with CB on Hal. His AC’s have been stout and barely noticed. Also, you gotta have Erik Skaden on any underrated list. I know he only races in NoCal but he’s tough and strong. Finally, Geoff Roes got little to no love in the UR voting and should have. Now, how about the most overrated? Or the fastest guy from Idaho:)? “Now, how about the most overrated? Hey I was first place last year in the Pikes Peak Marathon (for people from South Carolina). Not coincidentally, I was also last for people from South Carolina. @AJW – I offered to Craig to write those exact topics, I might hurt some feelings along the way. Fastest guy from Idaho? Sorry Jizzle, it’s not you. Kerry Lawyer is the fastest runner from Idaho, he ran 10.21 for 100 meters…. Gene defines the ultra spirit in so many ways. Gene is really the reason I am running my first 100 in June — really the reason I started running ultras. He has run, I dunno, 150-160 ultra’s and finished a good 30 some 100’s to include Hardrock. What you don’t know about Gene is he shows up to these ultras wearing road shoes (I have never seen him in trail shoes), swim trunks and his favorite Hawaiin shirt on no training and runs 100’s. He makes running an ultra attainable to the average Joe. Some ultra runners over engineer the sport, talk about their M-pace, T-pace, their nutritionist, their bowl movements, OMG you’d think they were launching the dammed Space Shuttle or doing something that was changing the course of hummanity…!!! Really??? So, if you haven’t ran the first 100 because you want to execute the perfect race….guess what, you won’t execute that perfect 100 on the first try no matter what…, get out there get ‘er done…Fatboy style! @AJW – Did you mean the fattest guy from ID? Um, yeah. That’s what I meant. Cougarbait: That is the best comment I’ve seen in a year. How come only one woman on this list? I think Meghan Arbogast is the most underrated female ultrarunner, at least in Oregon. She has done some amazing things and gets very little attention: Won Waldo outright in 2007, ran 3:58 at McKenzie River 50K, was 6th at the World 100K last year, qualified for the Olympic Trials marathon in 2008 for the third time (2:45), has a couple top-tens at WS, etc. Watch for her this weekend at WTC. Oh, and after the race she’ll be sportin’ her new Conduct the Juices shirt she won for the WTC trivia contest. @ AJW – Taker…in you know, I’ve been wanting write about that bad — in fact, I already have I just never published it! I think the sport asks us all to be takers. Its a selfish sport. I can do all the right things and in some ways I am still taking, whether it’s time from my family or the opportunity of cost of what I could be doing with all that time and energy for the greater community. The biggest taker amongst all of us takers? @Craig – You’ve got a point, I agree with you regarding Meghan as well, I overlooked her — like I said, the less we know about these people the more deserving they are to be on the list. I know you are talking current top ultrarunners here, but I had never heard of Ray Krolewicz until I met him at Across The Years. I googled his name and discovered he has won more Ultras than any other American. He’s a freaken legend. 80 wins from what must now be well over 400 ultra. starts. Maybe I just don’t know the sport well enough, but I’d consider his feats very underrated. Ray the K has had a column in a regional running magazine (running journal) in the south for many, many years. Ray the K is not underrated, your just that new to the Sport. I know he hasn’t done much lately, but even when he was running extremely well Phil Kochik was pretty underrated. I think he’s pretty healthy again, so we should start to see him running at a pretty elite level again. @Brian Morrison…talk about calling the pot calling the kettle black, you’re pretty darned underrated as well. I haven’t forgotten about 2006. Also, I saw you run really well at White River too…you could have easily been on the list. Just to be clear, nobody has forgotten about Brian Morrison. And I mean, nobody. Jureck underrated? By who? I would say that Hal and Jasper are at the top of the list if you are measuring off accomplishments. Perhaps after States this year their names will be removed? Jasper is more then a solid threat for a top five. Geoff Roes is so knew, it will take a bit of time to shore up the resume. It seems like any one that doesn’t win or place well in a 100 suffers from being “underrated” It seems like that distance gets most of the attention. How about Jenny Capel? 08′ Lean Horse = 16:55 & 09′ Jed Smith = 3:27. Helping to raise two young children and f’t job. Now that’s underrated! Mark Lundblad. He knows how to get it done. Humble pie, one of the nicest guys you’ll meet. new CR @ DV 50K in 08. HA!!!! The underrated list strikes again!!!! Craig, you may remember that Max King is the grandson of one of my friends. Proud Grandma called tonight to say that Max won the American River 50 yesterday with a time of 6hr/4min. He also just competed in the World Games in Jordan, finishing 40th. He also competed in the US Games, finishing third (?) so he is still on the US Olympic Team. While he now has a slot for the WS100 in June, he’s not sure if he’ll be running. @Judy and Luke – It is very exciting for our sport to have a runner of Max’s caliber. Maybe you can call Grandma back and convince her grandson to run WS. Does he know about the cool belt buckle he could win? Oh, but he’ll have pay extra for that buckle!!! I recall comments after the SOB 50K last year where folks were expecting Max to blow up, but he never did. Now he tops the field at 50 miles. Can he up the stakes and go to 100 miles? If there is a year to be at WS to really find out how you stack up, it may be 2009. I’d love to see him join the mix. He spent time coaching a few folks through speed work last spring and summer while training for the Olympic trials as a steeplechaser. however, if he lived out West his performances would be much, much better.